My family moved to our home in Corona de Tucson in 1976 when our daughters were in grammar school. Corona de Tucson is the closest town to the site of the proposed Rosemont open pit copper mine. We live but 6 miles as the crow flies from that dreaded abomination. We fear the destruction that will be wrought upon these lands by a mining company who plans to dig a mile deep, mile wide hole in the middle of one of the most beautiful places in all of Southern Arizona. I am writing today with comments in opposition to the proposed Rosemont mine. We came to Arizona from Colorado and were living in Tucson and needed to move my younger daughter, an asthmatic, away from the polluted city air that was becoming problematic. The doctors at Davis-Monthan Air Force Base explained that at one time the climate in southern Arizona was helpful to people with pulmonary disorders. However, with the increase in population and resultant vehicular emissions, the growth of pollen producing trees and plants not indigenous to the area and the dust from mining enterprises and quarries, the air quality had become seriously degraded. When we moved to Corona de Tucson, our child's health improved and we never regretted our decision to make our home at the foot of the beautiful Santa Rita Mountains. Sadly we now find ourselves engaged in a fight to save our air quality. The DEIS clearly states that dust storms may be exacerbated by activities that destroy the earth's crust and destroy vegetation, p 167. There is no “may” about it, the dust in the air will increase if the mine begins processing the millions of tons of rubble they will create. The average rainfall of 2 feet which mostly falls from July to September, cannot and will not settle the pollutants from the air. The DEIS plainly states that National Ambient Air Quality Standards, identical for both Arizona and Pima county, for particulate matter will be exceeded, and inhalable particulate matter 10 will come within 97% of the standard, p 168 . Particulate matter that is 10 micrometers in diameter or smaller can be extremely detrimental to one's health causing chronic bronchitis, asthma attacks, respiratory disease, heart attacks and other diseases that kill people. Too close for comfort for Pima County who denied Rosemont's air quality permit. All that is needed to surpass the allowable amount is less water or more wind. My husband, Bruce Whitehouse is the Fire Chief of the Corona de Tucson Fire Department. He has been involved with wild land fire situations for the past 30 years. His fire crew was one of multiple agencies that responded to the May 2 nd 2011 Greaterville Fire that started at the Rosemont mine site when an employee set fire to the dry grass in drought conditions and eventually burned 2,000 acres. An additional fire was started in Patagonia at a mine site on May 6 th by mine employees using a grinder. The Wildcat Fire burned almost 400 acres of public land and cost the taxpayers nearly $300K. The cost of the Greaterville Fire has not been released but was significantly higher. In the DEIS, p 580 , it is states that mine operations by their very nature “change fuel loads” and “increase the possibility of accidental wildfire” and “change the severity and extent of fires” when they occur. Rosemont has most assuredly proved that premise to be true. We didn't see any mention in the DEIS on the impact the smoke from wild land fires would contribute to the deterioration of air quality in the region. When Pima County denied the Air Quality Permit to Rosemont it was because the company failed to prove emissions would not violate federal air quality standards. A state approved air quality plan for Pima County would classify the mine as a major pollution source and would require Rosemont prove emissions from the proposed mine would NOT violate emission standards. Rosemont, in trying to do an end run on local decision makers, then went to the State of Arizona Department of Environmental Quality. Having learned that the Arizona state air pollution controls require issuance of a permit for a pollution source that would emit more than 75 tons of air condiments per day , Rosemont made the astonishing admission that it would do just that. (Arizona Daily Star of Nov, 12, 2011, Rosemont, rejected by Pima County, seeks air-quality permit from state by Tony Davis.) Obviously, if the mine is permitted to go forward, we would be subjected to more than 75 tons of uncontrolled contaminates blasted into the air on any given day whenever the giant hole needed to be expanded. The DEIS states a “maximum blasting process rate of 1 blast per day.“ p 178 . Add to this the emissions of airborne chemicals, vehicular exhaust and dust from traffic on unpaved roadways that in the DEIS are plainly estimates and imminently suspect. Clearly, a more extensive study is needed before a decision can be made on permitting the mine. Air Toxics ( DEIS p174 ) are pollutants that cause cancer in people and may have detrimental environmental and ecological effects. There are no sites for monitoring air toxics in the area of the proposed Rosemont mine, the closest 1 being in Phoenix. With the probability of substantial changes in air quality and the introduction of a myriad of contaminates, we suggest the Rosemont's parent company pay to install and maintain National-scale Air Toxics Assessment equipment at the mine site. When the discussion of climate change is raised above the level of partisan politics, scientists agree that the main contributor is the emission of green house gases. There will be a marked increased of green houses gases, particularly carbon dioxide, from vehicular traffic to and from the mine by large haul trucks, approximately 18 per hour or 6,600 hours per year per truck, employees traveling to and from work, emissions from heavy equipment, generators, and other machines. Obviously, the mine will contribute to the global problem of climate change through emissions. Plant life, with its tenuous hold in this desert clime, is easily destroyed. The loss of12,000 acres of land that now is covered with semi desert grassland vegetation or evergreen woodland (p 584) and the possible detriment to an additional 145,000 acres from ground and service water loss and the deterioration of water quality will also be a contributing factor in climate change. The property around State Route 83, Sonoita, Elgin and Patagonia are tourist havens with dude ranches, wineries, bed & breakfasts, wildlife sanctuaries, restaurants and hotels all making a living from visitors eager to enjoy the scenic wonders that make up that beautiful landscape. Sadly, visibility, an important aspect of air quality, will be diminished ( DEIS p 174 ) as a result of air contamination throughout the area of the mine and for as far away as the Saguaro National Park to the north of the mine site. The United State Army Corps of Engineers regulates nearly 50 acres of jurisdictional waters and slightly more than 210 acres of riparian area at the proposed Rosemont mine site. I addressed our concern vis-à-vis the water issue in a statement to Marjorie Blaine of the US Army Corps of Engineers referencing the 404 permit for the proposed Rosemont mine. We are unnerved by the threats presented by a mile deep open pit mine in our backyard. Four generations of our family have made our home here in this desert. Though many would find this an inhospitable place because of the menacing heat, the scarcity of water, the threatening flora and fauna, we love this desert and want our grandchildren and our 2 little great-grandsons to find their niche in this land we call home. For decades we have diligently conserved each drop of water because we know the precarious nature of the climate cycles, the constant threat of drought. Now that concern is cast aside with cavalier abandon by a foreign enterprise. Obviously, we are convinced it is not in the public interest to grant the application for permits by Rosemont. Permits should be denied and we are sure decisions will be made based on the best interests of the public you serve. We have been studying the proposed Rosemont project since it first loomed on the horizon in 2007. In 2003 we had endured a buffeting by the City of Tucson who threatened the residents of Corona de Tucson with losing our water supply. If we didn't kowtow to the extortion tactics of the Tucson City Council requiring developers in our area to sign pre-annexation agreements denying future residents the right to vote on annexation into the CoT, our wells could be jeopardized. Those wells, located just south of Corona de Tucson, were originally owned by Citizens Water Company and were first condemned and after a legal battle which we won, were purchased by the Tucson Water Department. We were informed the water from our wells could be diverted to Tucson should a water crisis occur. We were warned that, given the drought conditions in the Tucson basin, such a situation was a real threat. Has that threat evaporated? Suddenly, we learn, a foreign mining enterprise could take 1.7 billions of gallons of water every year from our aquifer. They will divert our groundwater, so vital for replenishing the parched desert land. They will bury steams and sumps, they will destroy the headwaters of Davidson Cañón, contaminate surface waters, destroy our tenuous water supply and thereby our very existence in this fragile environment. We can look to the west and see the “man-made mountains” in Green Valley that have contaminated and poisoned wells. Massive disturbances to Mother Earth force her to retaliate. We have heard the protestations that a whole new approach to mining will save water over current methods. But the company that is promoting Rosemont has never mined an ounce of copper. I have consulted with mining engineers at the Colorado School of Mines, where my father was a professor for many years, about these processes. Their answer, these schemes have never been tested in our desert climate. The experiment in mining of this sort has only been tried in Chile where the annual rainfall is 80 inches per annum as opposed our 2 feet. Should this amateur band find the new ways unsatisfactory, then more of our precious water will be required to earn their massive profits when they return to the old tried and true methodology. Once done, this open pit cannot be undone, once ruined, our home land cannot be restored. Rosemont's agents admit that depending on the different action alternatives there will be a reduction of storm water flow from between 45.8 % to 22.8%; between 8 and 15 stock tanks will be lost; and there will be a projected reduction of water through the Davidson Cañón from 9.7% to 3.6%. ( DEIS p 300 ) During our rainy season Scholefield, Wasp and McCleary Cañóns drain into Barrel Cañón which merges with Davidson Cañón then flows into Cienega Creek then into the Pantano Wash and eventually reaches as far north as the Santa Cruz River. A projection of a 10% reduction in surface water into Davidson Cañón would impact the entire Tucson basin. Since the City of Tucson has been in drought area for years, any decrease of as much as 10% of surface water demands a more extensive study than that referenced in the DEIS. Contractors employed by Augusta Resources, the investment company who is counting on making huge profits from the proposed mine, cannot be objective. We suggest the US Forest Service find a reliable, reputable company with no vested interest in the success of the permitting process to make an assessment of effects on the surface water should the mine be permitted. Mine tailings and leaching facilities pose the risk of contaminating surface water when sediment and pollutants flow into the watershed. Acid rock drainage is particularly alarming but inevitable when mineralized rock surfaces are exposed to the elements. (DEIS p. 339) Arsenic has been found in many wells in the Green Valley area as a result of surface water draining into the aquifer from the mine tailings that loom over the town. The DEIS specifically sites riparian habitat and riparian corridors in Cienega Creek will be lost as a result of the proposed mine. ( DEIS p 322 ) When one reads that mitigation for water contamination frequently results in payment of a fine in lieu of actual mitigation, one realizes how improbable actual mitigation will be. One has but to look into the Henry Lavender mine in Bisbee, at the stagnant pool of festering, toxic water at the bottom of that pit to see the results of copper mine water pollution. US Forest Service employees who are responsible for making a decision on permitting the Rosemont mine should take a trip to Bisbee or Morenci or Ajo and look at the results of huge open pit copper mines and the toll taken on the environment before they make up their minds. The proposed mine will use 1.7 billion gallons of ground water, 5400 acre feet, per year, as stated in the DEIS. (p 229) Household water availability will be reduced throughout the area. Drawdown near the pit would be100 feet or more; drawdown for residences on HWY 83 as high as 100 feet; Corona de Tucson where my husband and I live, the estimation is as much as 5 feet. The DEIS notes more groundwater has been withdrawn from the Tucson aquifer over the past several decades than has been recovered by the recharge of CAP water. In the past 10 years the drawdown in wells near the proposed open pit is already subsiding at the rate of up to 2 feet per year. Groundwater tables in the vicinity of Green Valley and Sahuarita are already in decline. Now, reduce the water table by the amount being pumped from wells in Sahuarita and you can see real jeopardy to the water supply in the greater Tucson area. Proponents of the mine rely on the recharge of CAP water into the aquifer. The DEIS states that delivery and storage of CAP water in the Green Valley is an unknown. (DEIS p 275) By 2030 projected deliveries of groundwater in the Sahuarita area will double. provided CAP water is available. We must always realize that delivery of CAP WATER is dependent on availability after delivery to the Tribes, to the cities and for agricultural use. (DEIS p 277) We cannot afford to gamble on our precious water supply. The proposed mine will result in a minerals leaching into the aquifer. Hazardous materials used in the mine process will be released into the environment. The fetid pit lake can cause injury to the environment. The Arizona Aquifer Water Quality Standards will be exceeded by dissolved metals and toxins. Leach facilities, waste rock, tailings, the pit lake and the mine process will pollute water in the area surrounding the mine and the groundwater will impact the water in the aquifer. ( DEIS p 281 ) More study is required on the impact of the mine on our groundwater. Again, we cannot afford to gamble on water quality in our desert clime where the availability of water is limited and what there is must be protected from contamination. I have been elected by the taxpayers to serve on the Governing Board of the Corona de Tucson Fire District for the past 12 years. I would be derelict in my duty to the people that I represent if I didn't address Fire Management in my comments to the USFS on the proposed Rosemont mine . The state of Arizona and the United States Government pay local fire departments to fight wild land fire. Money is allocated to fire departments by their governing boards for personnel and training for wild land fire crews and for supplies and equipment to support those efforts. Those expenses are funded by the taxpayers of the various fire districts. Fire Districts in the state of Arizona are funded by property taxes. The proposed Rosemont mine is not in our fire district and we will NOT receive funding from the mine. The DEIS clearly states the activities at the mine site will change fuel loads in the area, a vital component in the occurrence of wild land fires, which will increase the possibility of ignition of said fuels. (DEIS p 580) Blasting, increases in vehicular traffic, fuel loading, construction activities, and the transport and storage of flammable materials, explosives and fuels increase exponentially the probability of wild land fires. The cost of wild land fires will fall to the taxpayers in local fire districts or the state of Arizona or the US government. This cost must be considered when the proponents of the mine tout the influx of money the mine will bring to the local economy. Specifically, to our knowledge, the cost of the Greaterville Fire at the Rosemont mine site caused by a mine employee has not been assumed by the investment company that is a proponent of the mine. Since FOIA requests have not been successful we have no means of knowing the status of payment for the Greaterville Fire. The Corona de Tucson Fire Department is the closest Emergency Medical Service to the proposed Rosemont. The officers, firefighters and medics of the department as well as the governing board for the Fire District are concerned about traffic safety on Arizona state route 83 should the proposed Rosemont mine be approved. A 2-lane, winding road with minimal shoulders that is used by tourists in PoVs, motorcyclists, bicyclists, and school buses is not a good mix for haul trucks at the rate of 18 per hour or for vehicles hauling explosives, hazardous chemicals and fuels. The potential for accidents is increased and access by emergency vehicles is limited by the nature of the road. Increases in traffic on the road during year1 is projected to be between 10 and 88%, and by year 20 is projected to increase by over 350%. The CdT Fire Department responds to MVAs on Hwy 83 where simply traversing the roadway to the site of the accident is impossible because of traffic congestion, this is a 2-land road. This means the increased use of helicopters in the case of MVAs and entails longer response times for EMS providers. The cost is great but dwarfed by the dangers to travelers on the road. Proponents of the proposed mine say there will be 400 jobs created at the site of the mile-wide, mile-deep open pit in the beautiful northern Santa Rita mountains. They say the average job will pay $59K per annum, even though a search of the web for wage scales for miners in Arizona says the average pay is about $35K. Agents for the mine say this will be a boon to employment. This is about the same number of jobs created by Radiology Limited. If employment at Radiology Limited went away, would the economy of our area suffer irrevocably? I think not. Jobs will be lost at the Observatories in the Santa Ritas due to light pollution, estimated to increase by up to 2300%. These are high paying jobs, unique to this area. About 200 jobs will be lost at the FICO pecan farm as the water table drops and the trees dry up and die. The tourist industry along State Route 83 will suffer, restaurants, Bed & Breakfasts, dude ranches, wineries, all will lose their customers. Rosemont proponents say the mine site will draw tourists to the area. I took the mine tour but I was far from a tourist. I was there simply to revisit a beautiful area I had enjoyed in the past before it was put off limits by Rosemont and to hear for myself the propaganda the company was using to promote the project. Most of the people who tour the mine have, in fact, been lured there by the mine proponents with a free lunch and a propaganda barrage. How do I know this? Because I asked elderly people who attended USFS meetings as supporters of the mine who said they had been bussed there by the company after being treated to lunch. Just goes to show that some people will sell their soul for a free meal. As a personal aside, I was asked to serve on the Houghton Road Corridor committee whose duty it is to determine road improvements along that corridor through the year 2040. At my first meeting I was informed there would be NO MONIES committed to improvements of roads south of Interstate-10. No improvements to Houghton Road, no improvements, no paving, no culverts on Wilmot Road, Kolb Road would not be punched through to Sahuarita Road. I advocated for these improvements because of the increased traffic in our area since Corona de Tucson had increased in size over the decade of 2000 to 2010 by 590%. Houghton road, the only access to I-10 from I-19 east, is heavily trafficked and will be more congested when 2 new high schools open in July of 2012. I was absolutely gob smacked to receive a notice that the Pima Association of Governments Regional Transportation Plan was being expanded to include the allocation of $76 million to widen State Route 83 to 4 lanes where no allocation had been before. Can it be that this project is in aid of the proposed Rosemont mine? Since the projection for infusion of monies into the local economy from the mine is $20 million per year, a 76 million dollar investment in road improvements negates completely any financial benefit from the mine. 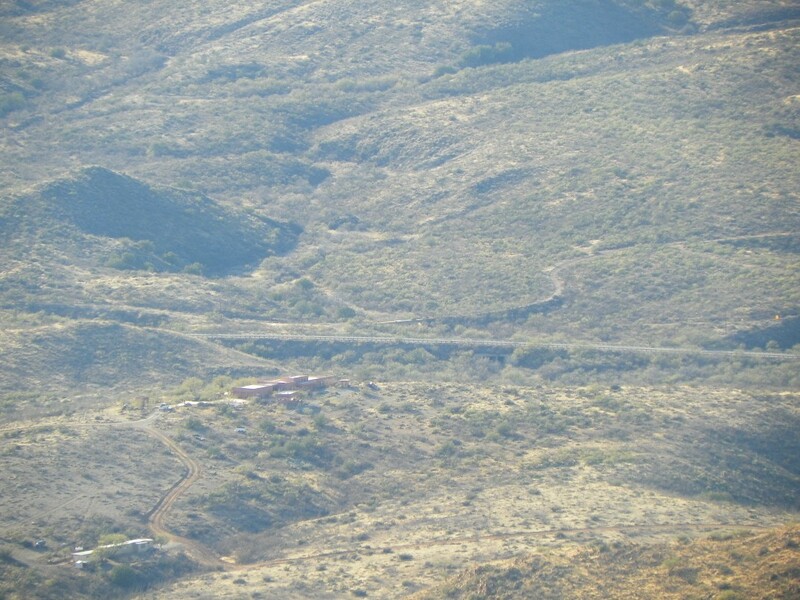 There is an additional allocation of $19 million to extend the Wilmot Rail siding, obviously in aid of transporting copper ore from Tucson to Mexico. There, another year of the projected $20 million tax benefit from Rosemont negated by expenditures for rail improvements. I have done my level best to delineate and define my opposition to the proposed Rosemont mine. Many of my reasons are personal. My family and I cherish this land we call home and we deplore any desecration of the beauty of the desert. We have been guardians of our environment and we taught our children and grandchildren to be the same. We want to leave our little great-grandsons a legacy, not of wealth, but of beauty, not of property, but of the majesty that is the northern range of the unsullied Santa Rita Mountains. We rely on the US Forest Service to fulfill their duty to the taxpaying citizens of this great country.